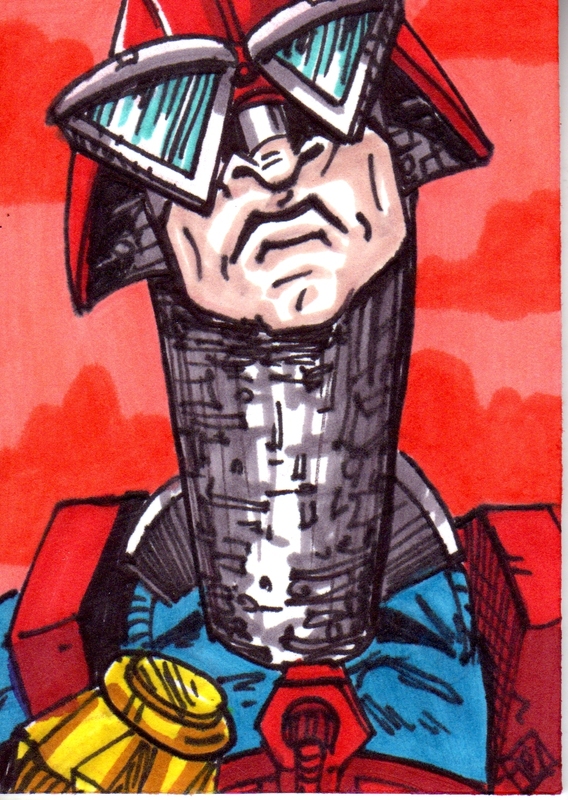 Taylor's Sweet Little Art and Nerd Site: Sketch Card of the day- Mekeneck! Today's deviation is Mekaneck. Mekaneck has always stood out in my mind as just plain weird. Not that he is weird because of his robotic neck ability, cause every master and evil warrior on Eternia, Etheria, and Despondos would hence be weirdos, but the logical side of Mek just doesn't work in my opinion. So let me explain. Mekaneck is a human, well Eternian... he's biological. Ok, he's a human life form native to Eternia that we will call a (HLFNE). There. So his power is super vision and a REALLY long telescoping mechanical neck that he uses to spy on the evil henchmen of Skeletor. So, if he is a (HLFNE) with robotic parts in him, like a cyborg, where does he store all of the links in his neck? I just don't think there is enough room in him shared with his guts and all for all of that neck! It just doesn't work! Honestly, I have had WAY too much time to think about this conundrum. It's Eternia: it's fantasy, Tay. Get over it. You can also see this sketch card here.